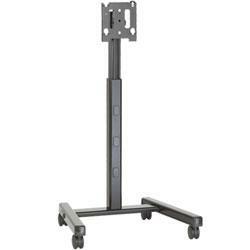 Mounts and stands for monitors or TV’s up to 30″. We have many freestanding and bolt down style mounts to choose from. Freestanding mounts are the most common since they sit on top of your desk for a quick setup. Depending on your mount style and monitor size, you may need to use a bolt down style base. See All Mounts to compare all mount styles. We also have clamp to desk style mounts in addition to wall mounts. 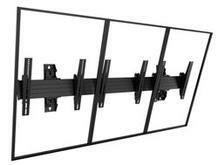 Large screen wall mounted systems for 2 to 5 displays wide, up to 55″, in portrait or landscape. The single horizontal extrusion with depth adjustment aligns the screens quickly even on irregular mounting surfaces and allows easy access behind the displays for servicing. Ideal for: Menu boards, video surveillance, transportation, display walls, control rooms, municipal and more. Perfect for rental, staging, production sets, trade shows, control rooms or corporate applications. Accessories available to add up to 2 additional displays. 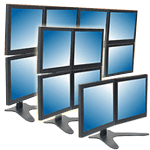 It is important to know what size monitors you have when shopping for a monitor mount. The specs on any of our mounts will read something like this: “supports up to 4 x 22″ monitors”, so you will need to know what you have. If you have any questions just give us a call now.